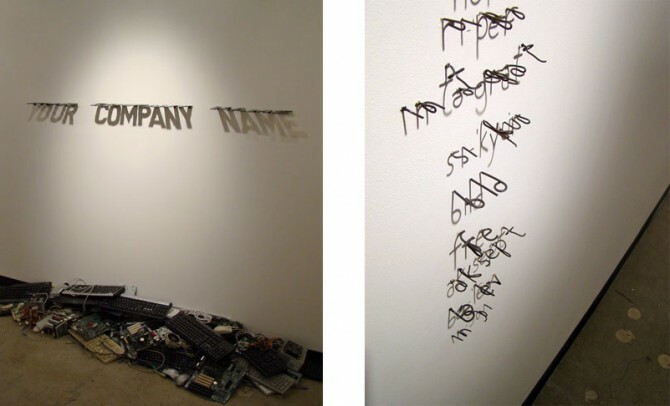 Feb 28, 2012 In: To Do List Tags: Adriane Colburn, emerging art, Intersection for the Arts, New York, non-profit art spaces, Southern Exposure, The Luggage Store Gallery By: ArtSource Inc.
San Francisco has a long standing history of artist-run non-profit art spaces. This month we recommend checking out a few of the most established ones that foster the emerging art scene. 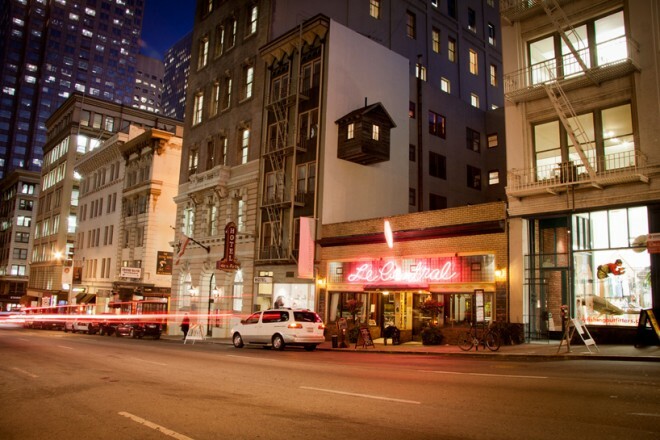 Through March 10th, Adriane Colburn’s Of Darkness at The Luggage Store Gallery, 1007 Market Street. Twenty-five years ago The Luggage Store, also known as the 509 Cultural Center, started as a volunteer collective. Today they continue to organize exhibitions, performing arts events, arts education and public art programs. 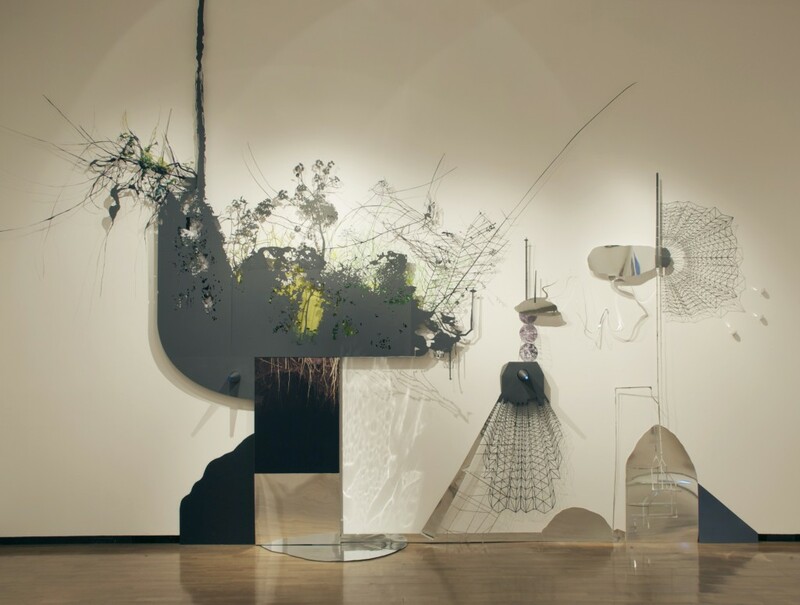 For their current media installation, artist Adriane Colburn uses her travels with scientists who study climate change in remote terrains to create elaborate cut-paper pieces, wood sculpture, digital images and video. The works in Of Darkness are part map, part science fiction and part psychedelic jungle. Adriane’s video piece can been seen March 1 – 8th as part of the Luggage Store Projection Space: International Women’s Day along with videos by artists Fatemah Abdoolcarim, Taraneh Hemami and Mail Order Brides/M.O.B. Saturday March 31st, Silver Era, Southern Exposure’s Annual Art Auction, 6-11pm, 3030 20th Street. Southern Exposure is a non profit visual arts organization that supports emerging artists and youth in a dynamic environment in which they can develop and present new work and ideas. For almost 40 years this organization has been exhibiting emerging artists, and their annual art auction is a great way to support their programming. 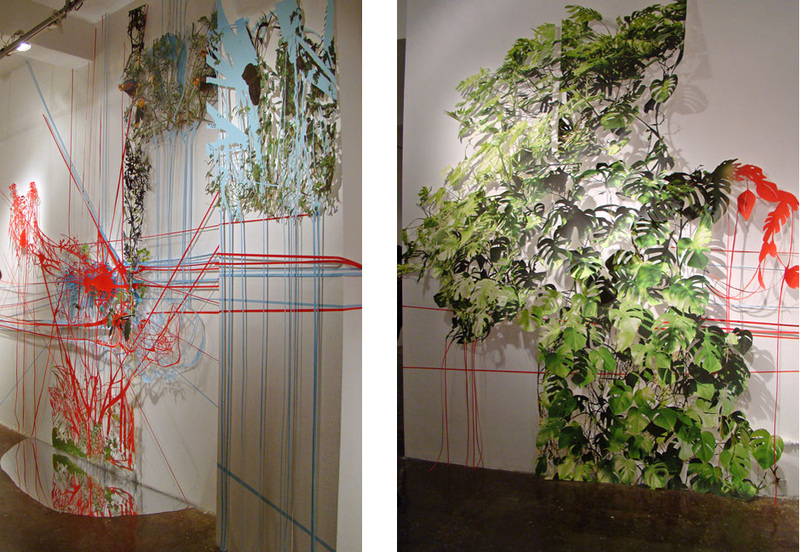 Ongoing to October 2012, Manifest Destiny!, Hotel Des Arts, 447 Bush Street. Next time you’re walking down Bush Street by Le Central, be sure to look 40 feet up in the air to see a new public art project sponsored by Southern Exposure’s Off-Site program. 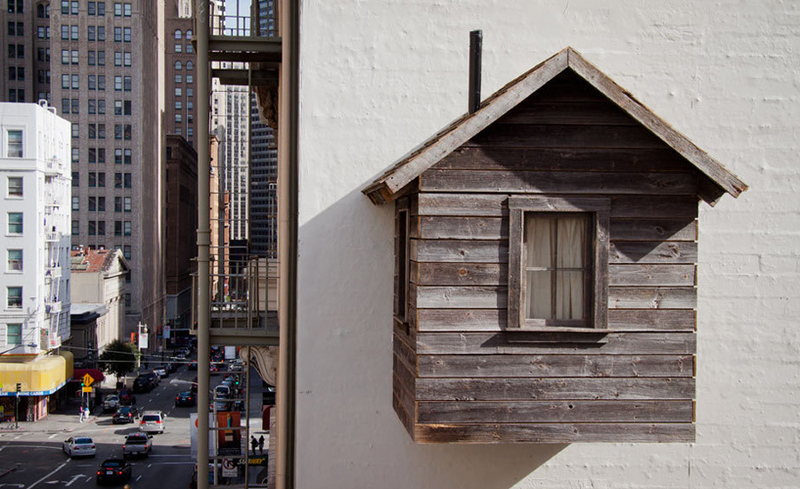 The project is a temporary rustic cabin that has been attached to the side of Hotel Des Arts, directly above the restaurant Le Central. Built in a 19th Century architectural style with reclaimed 100 year-old barn boards, the dwelling is meant to be an homage to the romantic spirit of the western myth. For more photos of the construction and installation of the piece visit www.designboom.com. 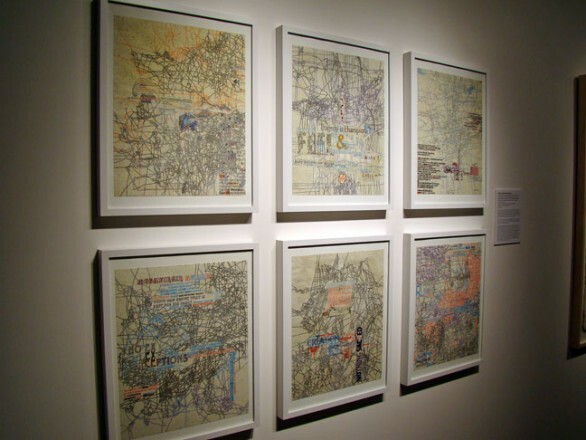 Ongoing to March 24, In Other Words exhibition at Intersection for the Arts, 925 Mission Street. For almost 50 years, Intersection for the Arts has initiated ground-breaking programming by presenting new work in the performing, literary, visual and interdisciplinary arts in the Bay Area. This group exhibition looks at language and its capacity to clarify and confuse, convene and separate, inspire and discourage. 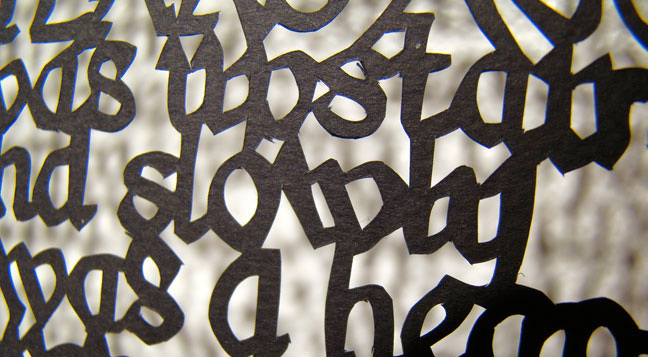 In conjunction with the exhibit they are sponsoring a word game night In Other Words: Balderdash on March 21st and they will close the exhibit with an Artist Talk on March 24th at 2pm. New York Art Fairs, March 7 -11. Next week will be the opening of several art fairs in New York. 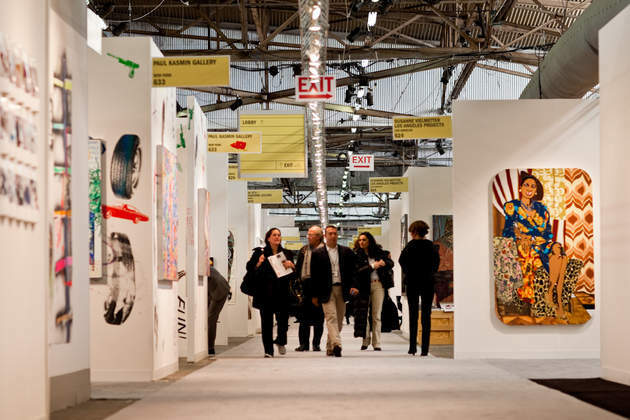 If you plan to be there visit The Armory Show, ADAA: The Art Show, Scope Art Show, and Volta Art Fair among others. Artsource will be there all week, so let us know if you need more information or passes.